Harvard and the WSJ’s inference was that there are no jobs—and hence no money—for graduates of liberal arts and humanities programs. Is enrollment in the liberal arts and humanities dropping dramatically? Do liberal arts and humanities degrees lack value that can be monetized? While graduates with humanities and liberal arts degrees may earn less immediately after graduating, in the long run they actually earn more on average than those with professional degrees. The answer to the question about enrollment in humanities and liberal arts programs, researchers found, is that while there has been a drop off, it has been small. Enrollment has dropped since the peak it achieved during the Vietnam War. However, when compared to 1950s numbers, enrollment percentages are only slightly lower. More importantly, “the percentage of college-age Americans holding degrees in the humanities has increased fairly steadily over the last half-century, from a little over one percent in 1950 to about 2.5 percent today,” according to Harvard graduate and Northeastern University professor Ben Schmidt. 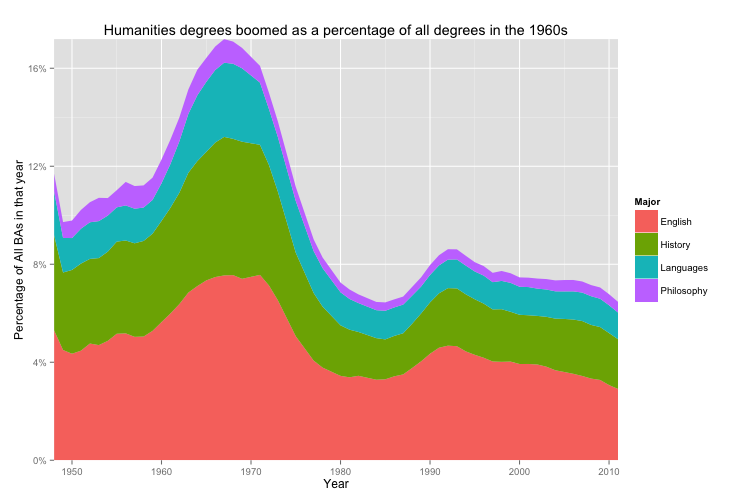 Percentage of Humanities and LA degrees in relation to population. Chart: Ben Schmidt. In an era of rising higher education costs, the debate over the value of obtaining a liberal arts degree is important. Yet just as some seemed ready to write off the value of these programs, many others are finding that the conceptual and analytical skills that study in the humanities and liberal arts promotes are becoming more crucial than ever before. Humanities, liberal arts and social science majors are often saddled with clichés linking a bachelor of arts degree with the ability to reason and write, but few other skills. Traditionally, the assumption was made that graduates with degrees in other fields of study had larger skill sets and could write and reason. But that is no longer the case. According to Verlyn Klinkenborg, a professor of nonfiction writing who has taught at Harvard, Yale, Bard, Pomona, Sarah Lawrence and Columbia’s Graduate School of Journalism, “many college students graduate without being able to write clearly.” In technical fields, this skill is simply not as important and thus not practiced and perfected. While doing research in both science and humanities journals for their book Academically Adrift: Limited Learning on College Campuses, Richard Arum and Josipa Roksa discovered that “Students majoring in liberal arts fields see ‘significantly higher gains in critical thinking, complex reasoning, and writing skills over time than students in other fields of study. '” By contrast, students majoring in business, education, social work and communications showed the smallest gains. Yet critical thinking and complex reasoning are crucially important to success in the marketplace. This long-run advantage takes hold, in particular, when liberal arts and humanities graduates go on to obtain graduate degrees. As technology continues to expand and the number of people with high levels of technical proficiency grows, a greater number of the available jobs will require the multidisciplinary skill set provided by a bachelor of arts degree. Technical jobs are often easier to mechanize, particularly as our computing abilities continue to grow and as our societies become increasingly networked. The liberal arts and humanities teach students to think at an abstract level and to make connections that technology, so far, simply cannot emulate. In this sense, these degrees teach more than just skills, but rather a way of thinking that will always have an important, strategic value—even in a marketplace that is based on scientific and technological development. This entry was posted on Wednesday, December 7th, 2016 at 10:10 am and is filed under Higher Education, Mastering Academia, Surviving Grad School. You can follow any responses to this entry through the RSS 2.0 feed.